A movement beside a patch of gorse catches the eye. Maybe it’s the twitch of an ear or the flick of a tail. Or perhaps a vague shape amongst the trees does not quite look like timber. Eliminate from consideration the possibility of commoners’ stock, and there’s a good chance that a New Forest deer has been encountered. Cherish the moment, for the New Forest and deer are inextricably linked. After all, William the Conqueror in the late 11th century specifically set aside this place as a Royal hunting ground, and called it Nova Foresta, or the New Forest. And remember, too, that these deer are properly wild, not semi-domesticated animals such as those found in country parks. Most are free to wander at will, to go just where the fancy takes them, exactly as in the Conqueror’s time, although strenuous efforts are made to keep apart the closely related red deer and sika deer, as otherwise they would probably inter-breed. Fallow deer, roe deer, red deer and sika deer are present in good numbers, and are often conspicuous creatures. Reeves muntjac deer also occur, but these tiny, secretive animals largely avoid notice. Perhaps confusingly, red deer and sika deer males are known as stags, whilst fallow deer and roe deer males are bucks. 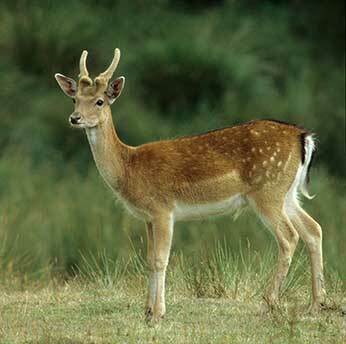 Similarly, red deer and sika deer females are hinds, whilst fallow deer and roe deer females are does. Newly born red deer youngsters are known as calves, and so are those of sika deer; whilst roe deer youngsters are kids, and fallow deer youngsters are fawns. Reeves muntjac males and females are are usually referred to as bucks and does, respectively, whilst youngsters are sometimes called fawns and sometimes kids. With a little experience, telling the species apart is reasonably straight-forward – see the deer identification pages for further details. But it’s always worth bearing in mind that a good view of a deer’s rear end is usually diagnostic, which is just as well, as sometimes that is all that is seen before the animal disappears from sight often with tail lifted as a warning sign to others, or if a roe deer, with caudal patch – the pale, rear-end patch where tail would be - fluffed out. Many New Forest deer are rightly wary of human presence, and are most likely to be seen early or late in the day when disturbance is at a minimum, although in secluded glades, deer may be glimpsed feeding or lying up at any time. Red deer, however, can be quite tolerant of a relatively close approach, and fallow deer at the Bolderwood Deer Sanctuary, where food is often put out, are almost tame. Senses are well developed, particularly those of smell and hearing. Twitching noses pick up the slightest trace of scent, whilst enormous ear flaps can be lifted and turned through improbable angles to channel sounds down to the eardrum. Sight, though, is not quite so keen, which probably explains why disturbed deer that are unable to pick up scent or sound, so often move away for a short distance, then stand and stare back as if trying to obtain a better view that will enable them to decide exactly what it is that has encroached upon their space. All, though, are fleet of foot and at the slightest hint of danger are able to melt unseen into the undergrowth, often after a few paces of stiff-legged, bouncing alarm-gait – it’s called ‘pronging’.